SS1 Caseres 1 (gravel) (12.50 km) 7:18.8 3. 3. WRC 102.6 0.17 7:18.8 3. "I was in a different mood at the beginning, then I got into a good rhythm and it was better." / "Na začátku jsem nebyl správně naladěný, pak jsem chytil dobrý rytmus a bylo to lepší." SS2 Bot 1 (gravel) (6.50 km) 4:05.5 5. 5. WRC 95.3 0.15 11:24.3 4. SS3 Terra Alta 1 (gravel & asphalt) (38.95 km) 25:12.4 9. 9. WRC 92.7 0.45 36:36.7 7. SS4 Caseres 2 (gravel) (12.50 km) 7:10.7 6. 6. WRC 104.5 0.21 43:47.4 8. SS5 Bot 2 (gravel) (6.50 km) 3:59.8 6. 6. WRC 97.6 0.32 47:47.2 8. "I tried to push hard but with a second spare wheel its not so easy and the rear moves around a lot. But now I have two new tyres for the long stage and hopefully I can catch up some more time." SS6 Terra Alta 2 (gravel & asphalt) (38.95 km) 24:21.9 3. 3. WRC 95.9 0.08 1:12:09.1 7. SS7 El Montmell 1 (asphalt) (24.40 km) 12:28.1 4. 4. WRC 117.4 0.25 1:24:37.2 6. SS8 El Pont d'Armentera 1 (asphalt) (21.29 km) 10:56.4 3. 3. WRC 116.8 0.08 1:35:33.6 5. "It feels better but still not what I want. The car feels okay but my pace notes were too slow and I was not committed enough. We need to improve." / "Stále to není to, co bych si představoval. Rozpis byl moc pomalý." SS9 Savallà 1 (asphalt) (14.12 km) 7:37.7 10. 10. WRC 111.1 0.88 1:43:41.3 8. "We lost hydraulic pressure at end of the stage before. Then the car would not start and I had to drive quickly to the start of SS9. I spun on the road section and hit the rear." / "Na konci předchozí RZ jsme přišli o tlak v hydraulice. Auto nešlo nastartovat. Pak jsme rychle přejížděli na start RZ9, udělal jsem hodiny a naboural zadek." SS10 El Montmell 2 (asphalt) (24.40 km) 12:25.3 1. 1. WRC 117.9 1:56:06.6 7. "No, the car feels okay," he says. "I still struggled a bit with understeer and we can make a few changes but it's difficult to make a difference in these conditions. We have to be clever." / "Těžko se v těchto podmínkách něco stahuje, musíme jet chytře." SS11 El Pont d'Armentera 2 (asphalt) (21.29 km) 11:00.2 2. 2. WRC 116.1 0.03 2:07:06.8 7. "It was okay, the car is behaving itself better. It felt comfortable so I was able to go at a good speed. Okay, we lost a lot of time for technical reasons but we keep going - everything is possible." / "Ztratili jsme nějaký čas díky technickým problémům, ale uvidíme, může se stát cokoliv." SS12 Savallà 2 (asphalt) (14.12 km) 7:31.7 6. 6. 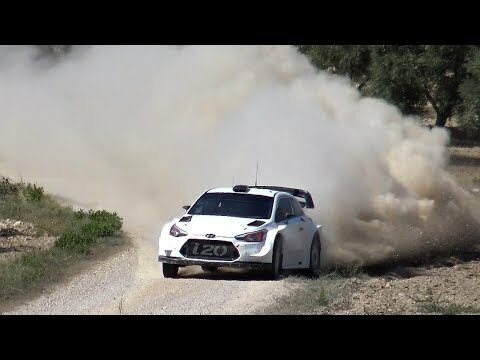 WRC 112.5 0.12 2:14:38.5 5. "It's not over, even if I think we deserved better than this. What can we do?" / "Ještě není konec, zasloužili bychom si lepší umístění, ale co naděláme?" SS13 Salou (asphalt) (2.24 km) 2:35.8 5. 5. WRC 51.8 0.89 2:17:14.3 5. 2. WRC 93.4 0.18 2:21:16.3 5. "I have no choice," he says. "I pushed very hard. I started understeering near the end but I have to catch Juho today at least. I have finished second in this championship twice before - so I have nothing to lose." / "Nemám co ztratit, chci minimálně dohnat Juha." SS15 Riudecanyes 1 (asphalt) (16.35 km) 10:25.6 6. 6. WRC 94.1 0.33 2:31:41.9 5. SS16 Santa Marina 1 (asphalt) (14.50 km) 9:21.9 31. 31. WRC 92.9 4.99 2:41:03.8 6.